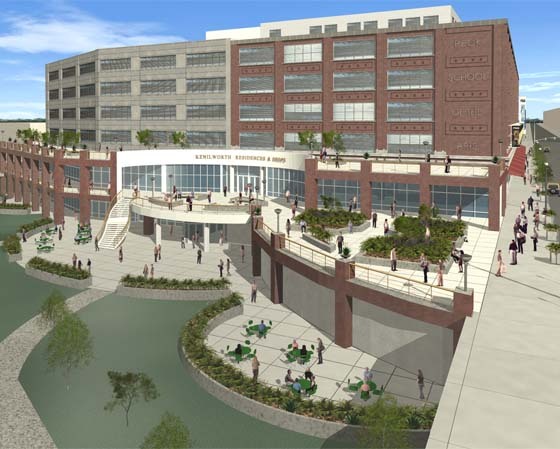 In response to its growing resident student population, The University of Wisconsin Milwaukee (UWM) requested design and development concepts for the redevelopment of an existing five-story warehouse into Student Housing with additional space for the Peck School for the Arts. Located on Milwaukee's East Side between the downtown and the UWM campus, the property is four blocks from Lake Michigan in a high-density residential neighborhood. Planning concepts encourage street life activity and integration with the surrounding neighborhood. The student residences create 24-hour activity within the building and help support ground floor retail amenities. Book stores, cafes and programmed art gallery and theater spaces would be housed on street and lower levels. It will also provide 400 apartment-style student housing units arranged on four floors and a penthouse. The upper three main floors are configured around a new central courtyard carved out of the old warehouse structure. The atrium-style planning concept maximizes natural light to the student residences. This approach also allows for the Peck School of Arts studio spaces to become a focal point in the courtyard which doubles as a sculpture garden.